TAIPEI, Taiwan, June 16, 2011 – AMD’s latest AM3+ processors are a shot in the arm for PCs, delivering start of the art processing at unmatched performance. ASRock superior AMD 9 series motherboards have been designed to support the new-gen AM3+ processors, while still retaining backward compatible with AM3 processors and unprecedentedly implementing support for SLI technology. To bring the best kit to users, ASRock has thrown everything you could want from the new-gen AMD 9 series motherboards. The innovative features include the ASRock signature XFast USB, On/Off Play Technology, Graphical UEFI, All-in-one AXTU program, and so on. ASRock 990FX Extreme4 motherboard is ASRock’s top-of-the-range model. 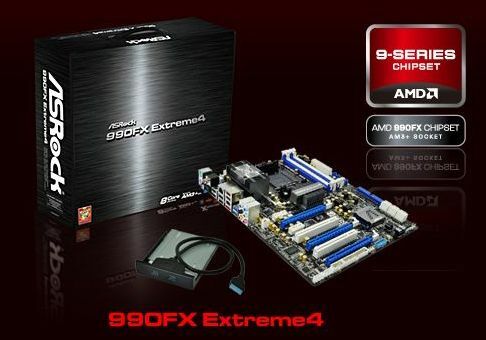 Powered by AMD 990FX and SB950 chipsets, this board features Premium Gold Caps, advanced V8 + 2 Power Phase Design and multi-GPU options. ASRock AMD 9 series mainboards also allow users to easily unleash their system's hidden USB performance with ASRock’s innovative XFast USB Technology. Designed for the next generation computing, this board still supports AM3+ socket and is compatible of 8-Core series processors. Do you desire to make SLI technology running on AMD motherboard? Well, ASRock 990FX Extreme4 allows users to take advantages of both CrossFireX and SLI technologies. We always give you more than you expected! Meanwhile, ASRock also introduces another great motherboard: 970 Extreme4. Based on 970 chipset, this board is marked by its versatile solutions. To name a few, 3 PCI Express slots cater for multi-GPU settings, manageable smart switches and Dr. Debug, offering flexible options which will appeal to DIY users. Beside its onboard equipments, this board also features superior software tools such as mouse-controllable Graphical UEFI, XFast USB that optimizes USB transfer speed performance and On/Off Play technology. What makes this board becomes more distinctive; however, it’s the SLI technology. 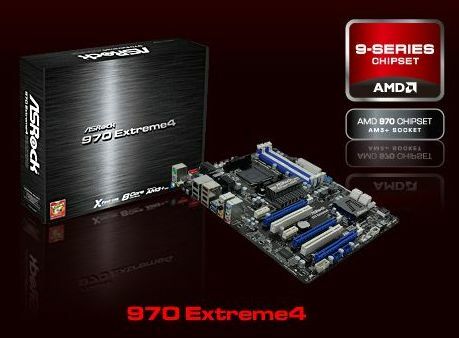 The ASRock 970 Extreme4 is the first AMD 970 motherboard supporting Nvidia SLI technology in the world! With a wide range of prominent functions, advanced DIY users should not miss 970 Extreme4! The latest ASRock AMD 9 series motherboards come with a bucketful of technologies aimed at delivering the ultimate PC experience!